Aim: To assess the clinical performance of zirconia (ZrO2) infused glass ionomer cement (GIC) compared to conventional GIC. Study Design: Experimental, in vivo, intergroup split-mouth study. Methods: Cavities were prepared on bilateral teeth and restored with Conventional GIC on one side and ZrO2infused glass ionomer on the other. The two sides were compared with regards to their clinical performance and color stability. Results: Statistically significant differences were found with respect to surface texture and color match between ZrO2infused GIC and conventional GIC. Statistics: Results were analyzed using Friedman test and Wilcoxon test. Conclusions: ZrO2infused GIC showed better color stability but conventional GIC was much better as far as color match, surface texture, and marginal adaptation were concerned. Background: The aim of the present finite element study was to analyze effect of cuspal inclination on stress distribution and implant displacement in different bone densities for a single tooth implant. Materials and Methods: A three dimensional finite element model of mandibular molar section of the D1 bone (entirely cortical) and D4 bone (1 mm cortical shell with low density trabecular core) to receive an implant was constructed. Three ceramic crowns with cusp inclinations of 0 degree, 10 degree and 30 degree were modeled. 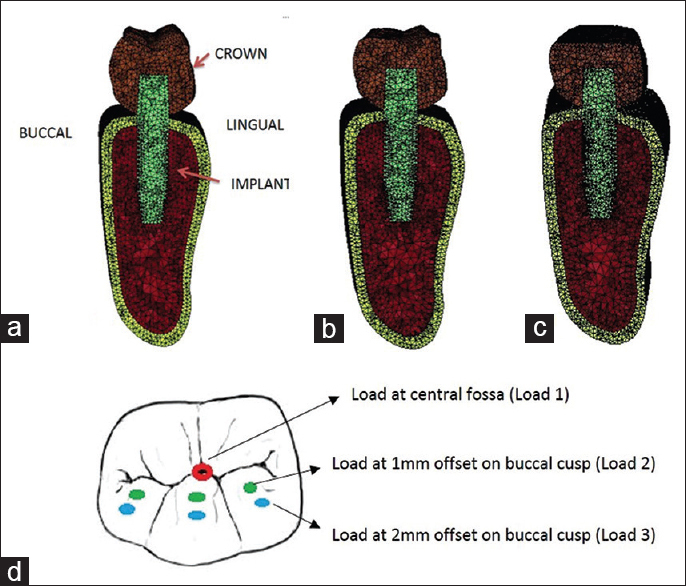 A mechanical load of 202.23 N was applied at three different regions; the central fossa and 1- and 2-mm offsets horizontally from the center to the buccal side for the varying inclinations. The finite element analysis was performed and stress levels using von Mises stresses and maximum displacement (in mm) were calculated. Results: The maximum stress concentration in cortical bone was seen around the neck of the implant. There was favorable distribution of stresses during loading at the central fossa with maximum stress being 15.10 Mpa for 0 degree, which increased to 54.09 Mpa for 10 degree and 86.19 Mpa for 30 degree inclination at 2 mm offset. Higher stresses were generated in D4 than D1 bone density under all loading conditions. Conclusion: The occlusal topography plays an important role in stress distribution and may be helpful in preventing crestal bone loss. This phenomenon is more pronounced in poor quality bone. Therefore, proper occlusal morphology becomes a critical issue in poor quality bone for implant longevity. Introduction: The aim of this study was to evaluate the effects of calcium hydroxide [Ca(OH)2] and propolis intracanal medicaments on the push-out bond strength of a resin-based sealer (AH Plus) to root dentin. Materials and Methods: After chemomechanical instrumentation using ProTaper rotary system, three groups of root canal specimens were prepared: 10 root canals were left untreated as controls (G1), 10 received Ca(OH)2intracanal medicament (G2), and another 10 received propolis intracanal medicament (G3). 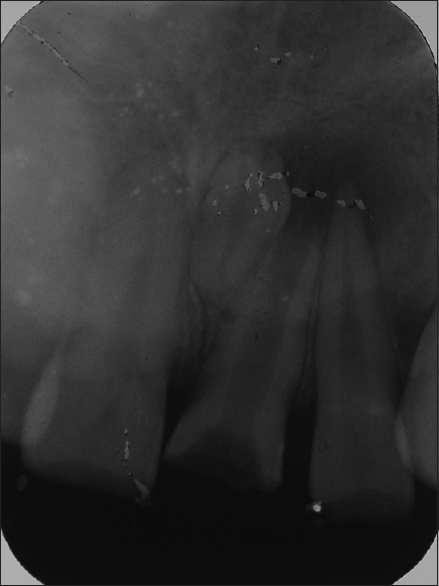 Canals were obturated with AH Plus and gutta-percha. After bond strength evaluation using push-out test, data was analyzed using 2- way ANOVA and Tukey post hoc tests (P = 0.05). Results: At coronal and middle thirds, there were no significant differences in bond strength among the three groups (P > 0.05). At apical third, G3 was significantly superior to G2 and G1 (P < 0.05), but there was no significant difference between G2 and G1 (P > 0.05). Conclusion: The use of propolis as an intracanal dressing material, with AH Plus used as the sealer in endodontic therapy was shown to have better sealer-dentin interfacial bond strength. Purpose: To assess the motivational factors and future career aspirations of dental interns. 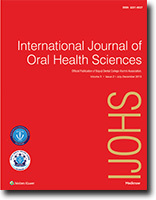 Materials and Methods: A descriptive cross-sectional survey was carried out among 88 dental internees. A self-designed questionnaire was used to collect information regarding motivational factors in choosing dentistry as a career, future career plan, and students' attitude toward the profession. 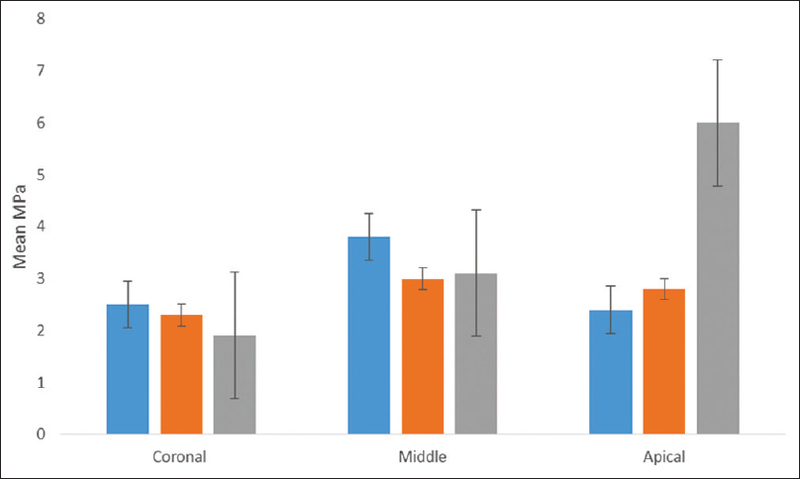 Chi-square test was employed to find the association between motivation factors and career aspirations among male and female interns. Results: The study results showed that majority of students (48.9%) were self-motivated (own interest) for choosing dentistry as a career and 31.8% had chosen dentistry due to parent's interest. About 28.4% chose dental profession as it has good job security and 27.3% of students for financial security. On completion of their undergraduate course in dentistry, 35.2% preferred to pursue postgraduation in India, 29.5% wanted to go abroad for further studies, and 6.8% desired to establish private practice. 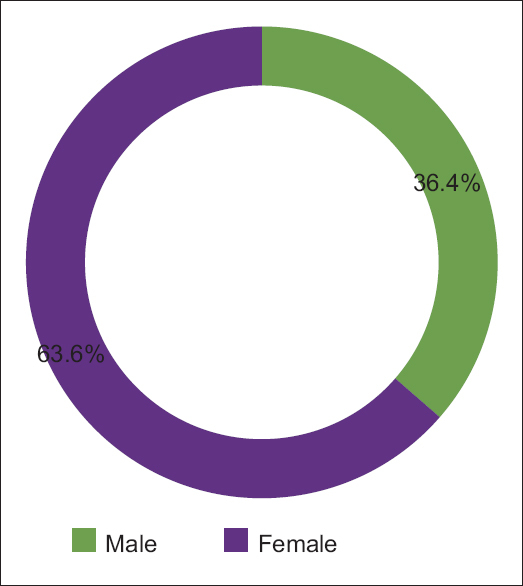 There was a marginal significant association between male and female study participants to join postgraduation as a career choice (P = 0.05). Majority (83%) of the study participants were happy with their dental profession and almost 72.7% of the study participants agreed that they have enough abilities to treat the patients. Conclusions: The study concludes that student's own interest, job, and financial security are the major reasons for pursuing a master degree. The reasons for choosing dentistry have important implications for the selection and training of students as well as for their future job satisfaction. The most common types of orofacial pain originate at the dental or periodontal region or in the musculoskeletal structures. However, sometimes a patient may present pain in these regions even though the source is located elsewhere in the body. One possible source of heterotopic pain is of cardiac origin, which pose a diagnostic challenge. In 6% of patients, craniofacial pain can be the first and the only symptom of cardiac ischemia. Misdiagnosis of these cases may lead to unnecessary dental treatment and a significant number of deaths due to atypical symptoms of coronary disease. Implant restorations, a boon to dentistry, often suffer from ridge and soft tissue deficiencies because of the postextraction tissue remodeling. This hindrance could be overcome through soft and hard tissue augmentation as future implant site development. A good pink carpet is one of the prerequisite for esthetics around implant restoration, which could be achieved adequately through hard and soft tissue grafting procedures. In this regard, many techniques have been advocated, wherein the pedicle grafts gained popularity owing to the ability to maintain intact vascularity. Palatal tissue is desirable graft of choice for its thick biotype. Thus a combination of palatal tissue with pedicle grafts are said to be novel in this application. 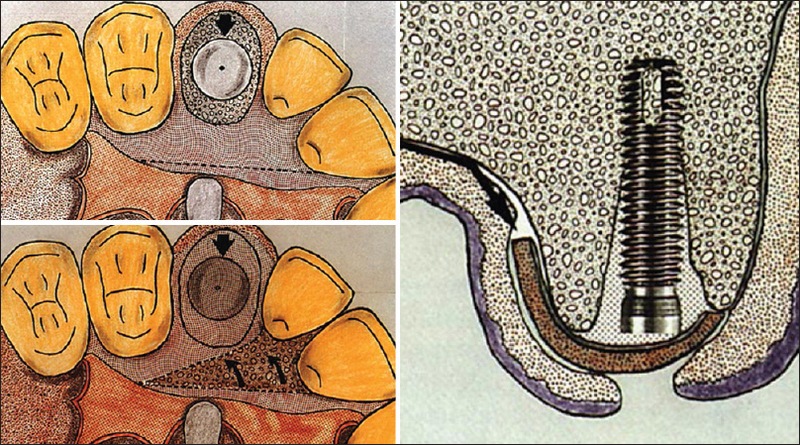 In this article, we discussed the applications of different palatal pedicle grafts along with elaborating their varied applications in three patients. Cervicofacial infections of dental origin are the most difficult and complex issues in our day to day practice. Perceiving the severity of the condition at the earliest is of utmost importance since they are known to spread rapidly to the surrounding soft tissues and can even spread to vital structures such as paranasal sinuses, orbits, intracranial sites, and even to mediastinum. Orbital cellulitis is a postseptal cellulitis involving intraorbital muscles with diminishing visual acuity. Aggressive treatment more frequently with surgical intervention along with higher antibiotics in a well-equipped hospital is required since it is associated with rapid deterioration. A 40-year-old male who is a known diabetic and smoker underwent dental extraction and presented with fever, left facial swelling with the blurring of vision. Clinically he was in sepsis having crepitus over left facial swelling, edema of left eyelids with proptosis with facial nerve palsy. 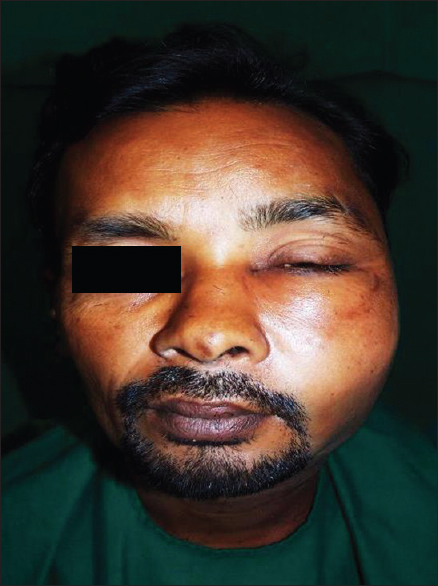 On investigating further, he was found to have left cervicofacial abscess associated with left orbital cellulitis due to odontogenic infection with very high blood sugar level. Cervicofacial abscess of odontogenic cause is a life-threatening complication. 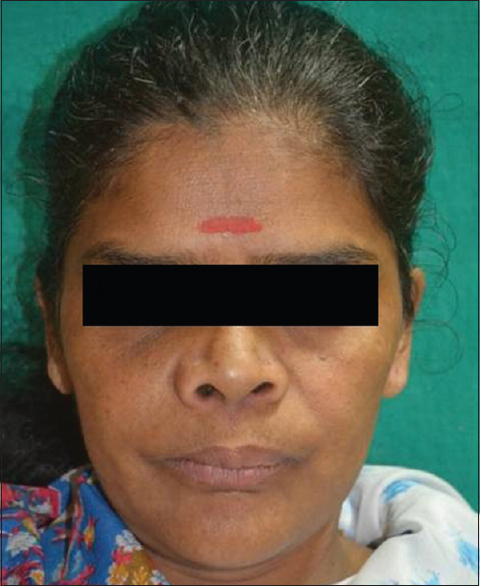 In this case report, we have highlighted the unusual findings of orbital cellulitis and facial nerve palsy associated with cervicofacial abscess since a handful of cases have been reported about the same in the literature. Early recognition with prompt surgical and antibiotic treatment is implemented for good prognosis and outcome. 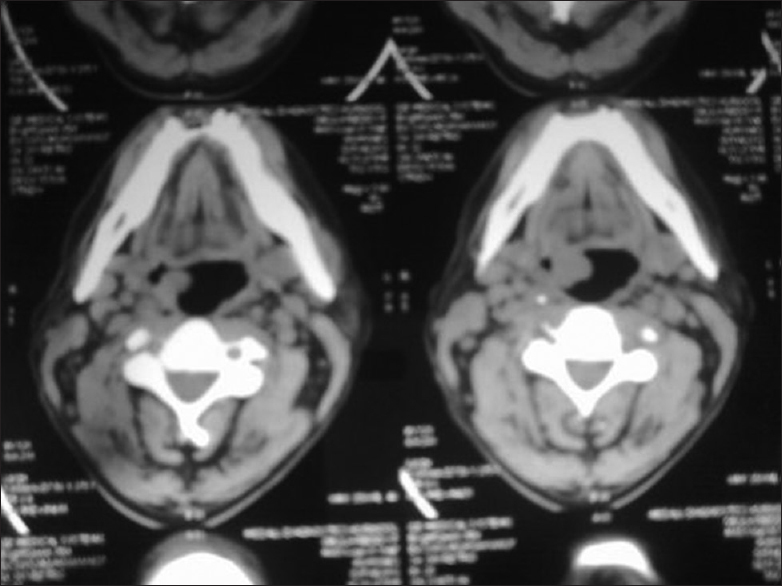 The pleomorphic adenoma comprises the majority of both major and minor salivary gland tumors accounting for 3–10% of neoplasms of head and neck region. The palate is the predominant intraoral site, and the mucosa of the cheek is an uncommon site for these tumors. These minor salivary gland pleomorphic adenomas require diagnosis based on clinical features and incisional biopsy should be avoided. These are managed by wide surgical excision. The recurrence of this tumor is a well-known factor, and inadequate initial surgical procedure is the most common cause of recurrence. Carcinoma arising from pleomorphic adenoma accounts for about 3% of salivary tumors. Recurrence rates and malignant transformation of this tumor cells for long-term follow-up of these cases. We are reporting a case of pleomorphic adenoma in the left buccal mucosa in a 48-year-old female patient. The occurrence of a malignant lesion in oral cavity raises the possibility of most commonly squamous cell carcinoma. However, there are other malignant lesions that can arise in the tongue. Lymphomas in the tongue/Waldeyer's ring can pose a diagnostic challenge. Here, we present a rare case of Mantle cell lymphoma primarily presenting as a tongue lesion with a deceptive appearance that requires a high grade of suspicion and judicious use of immunohistochemistry (IHC) to reach the diagnosis. The recognition and differentiation of this entity are important because of its aggressive clinical behavior. Supernumerary teeth are considered as one of the most significant dental anomalies during the primary and early mixed dentition stages. They may be single, multiple, unilateral or bilateral erupted or unerupted, and in one or both jaws. Supernumerary teeth occur more frequently in the permanent dentition but rarely in primary dentition. Mesiodens is the most common type of supernumerary teeth but rarely seen in the lower arch. 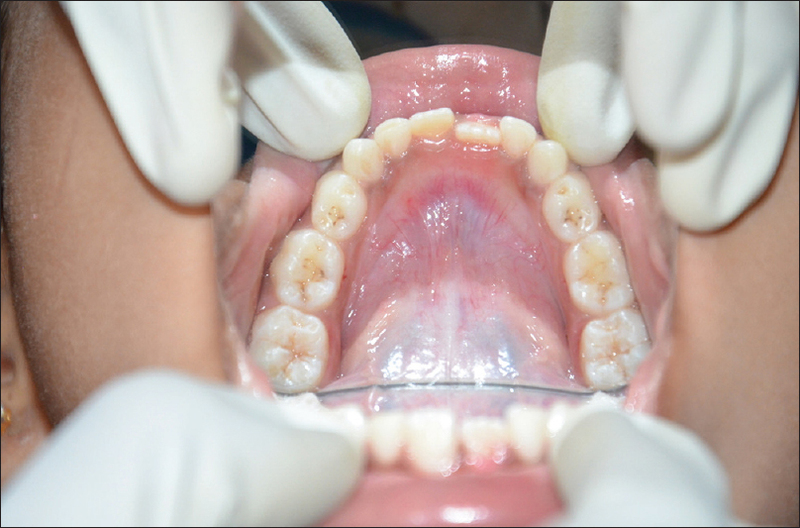 Multiple supernumerary teeth are usually associated with conditions such as cleft lip and palate or syndromes like cleidocranial dysplasia and Gardner's syndrome. They are of great concern to the dentists and patients because of the eruption, occlusal, and aesthetic problems they can cause. Early recognition and diagnosis of supernumerary teeth are important to prevent further complications in permanent dentition. Our case represents ten supernumerary teeth in permanent dentition, of which 8 were erupted and 2 were unerupted with no associated syndrome. Supernumerary teeth are defined as the dental structures present besides the normal series of deciduous or permanent teeth. Mesiodens are the most common supernumerary teeth, occurring in 0.15–1.9% of the population. The precise etiology of mesiodens is yet uncertain and is not fully understood, although proliferation of the dental lamina and genetic factors has been implicated. Often mesiodens produces complications while in certain instances, mesiodens are accidental radiographic findings. Early diagnosis often reduces the chances of occurrence of any future complications. Treatment is the surgical extraction of the mesiodens, however the decision to extract this supernumerary tooth should be based on a risk/benefit analysis. 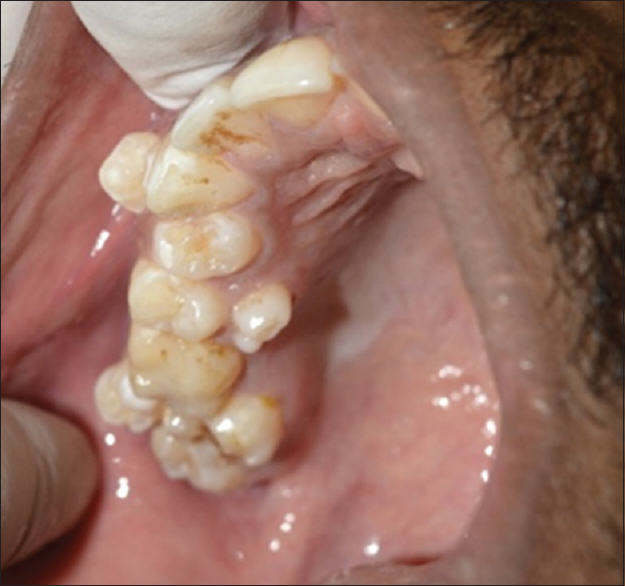 This paper presents a case of inverted, labially impacted mesiodens which had led to nonvitality of the central incisor. Radicular cyst is the most common odontogenic cyst occurring in the jaws. The cyst is commonly found in relation to the maxillary anterior teeth in the third and fifth decade of life. It arises from epithelial remnants and has been classified as inflammatory cyst, as a consequence of pulpal necrosis following caries, with an associated periapical inflammatory response. Hereditary defects like amelogenesis imperfecta can also lead to early loss of enamel, causing pulp exposure and necrosis, which ultimately may lead to radicular cyst. Radiographically, radicular cyst appears as a round or oval, well-circumscribed radiolucent image involving the apex of the tooth. This paper presents a case of multiple radicular cyst and amelogenesis imperfecta.